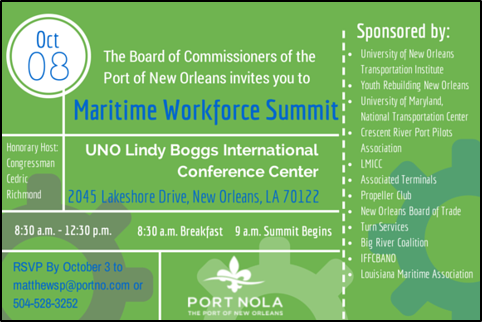 NEW ORLEANS - With a focus on educating and engaging community stakeholders on maritime jobs opportunities, the Board of Commissioners of the Port of New Orleans and the University of New Orleans hosted the 1st Annual Port of New Orleans Maritime Workforce Summit on October 8. "The goal of this summit is to inform the Greater New Orleans community stakeholders of maritime job opportunities, engage industry leaders to identify maritime workforce needs and leverage regional economic efforts to strengthen multimodal transportation at the Port of New Orleans," said Gary LaGrange, Port President and CEO. "I want to thank all of our partners and sponsors for their efforts supporting this worthwhile event." The summit featured opening remarks from UNO President Peter Fos and U.S. Rep. Cedric Richmond. Port Purchasing and Contract Administration Manager Terry Martin will provide a presentation for small businesses wishing to do business at the Port. Several panel discussions are scheduled to focus on trade and transportation logistics, career education, and economic and workforce development. "The maritime industry is an economic engine and the source of high quality jobs in Louisiana," said Rep. Cedric Richmond. "As a strong supporter of the industry I am honored to participate in the 1st Annual Maritime Workforce Summit and look forward to the information and opportunities it will provide for our community." Summit sponsors include UNO, Youth Rebuilding New Orleans, NTC@Maryland, Merrit C. Becker Jr. UNO Transportation Institute, Associated Terminals, Turn Services, The New Orleans Board of Trade, Crescent River Port Pilots’ Association, Big River Coalition, Louisiana Maritime Association, Propeller Club of the United States – Port of New Orleans, LMICC, International Freight Forwarders Customs Brokers Association of New Orleans. The World Trade Center of New Orleans served as a promotional partner.